In house laboratory services are provided at Mission Veterinary Clinic because we strive to provide your pet (dog or cat) with the best veterinary health care possible. We use lab testing for health screenings, pre-anesthetic evaluations, and as an aid in diagnosing pets (dogs and cats) with illnesses. 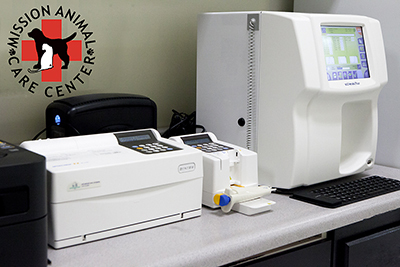 Mission Veterinary Clinic and Animal Emergency Hospital uses an in-house lab that provides us with the ability to perform CBC, Health Profiles and Electrolytes. We are able to obtain results within minutes, this is of great importance for immediate pre-anesthetic testing if your pet (dog or cat) needs surgery, as well as for evaluation of your pet’s health in case of an emergency. We also work with an outside laboratory when more comprehensive or specialized veterinary testing is needed. for performing tests on dogs and cats.